Stability and tranquility have been the norm in our weather for the past week...and despite a cool down those trends continue this weekend. It changes next Tuesday, however, as a storm system impacts our region. This storm comes ashore on Friday in the Pacific Northwest and travels slowly across the country, hitting the East Coast Tuesday night and early Wednesday with rain (and snow in the Great Lakes). Assuming the track isn't suppressed farther south -- the storm looks like it will be a rain maker for our region. Most modeling has kept the center of low pressure to our north although an occasional GFS or Euro run suppresses the low on a track a lot closer to us. As high pressure isn't over Eastern Canada and is instead in the Atlantic, the track of the low will be more likely (I think) to go to our north and northwest. This means rain for us. If you look at last night's run of the Euro you can see a pretty decent rain event for next Tuesday night and early Wednesday -- we could get a half inch or more of rain (our largest rainfall since Sandy has been 0.39" with the nor'easter that couldn't make it snow) if the Euro and GFS are right. 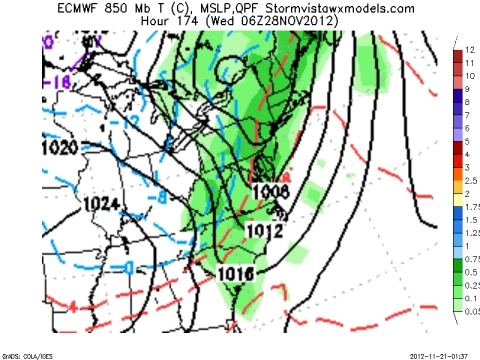 It's still a week out but a rainy scenario has been consistently modeled for the midweek timeframe next week. In the wake of this low we return to a chilled pattern. You can see the colder temperatures aloft back in Minnesota and Wisconsin -- temperatures at 5000 feet are over 12 degrees below zero Celsius. We won't see that level of chill here but we will likely see highs back in the 40's late next week as we set the stage for a cold start to December.